For the city which is located in a region with eventful prehistory and history, the history of Çanakkale is surprisingly short. This settlement was established when Sultan Mehmed the Conqueror ordered the construction of Çimenlik Castle in 1461. The building materials for its construction were obtained mainly from the nearby ancient city of Abydos. At the same time, Kilitbahir Fortress was erected on the European shore of the Dardanelles. These sister fortifications were built at the narrowest point of the strait, with the aim to protect the waterway to Istanbul. Initially, the settlement was known as Kale-i Sultaniye, from the Sultan's fortress rising on the coast. As the time passed, the settlement grew and took on the name of Çanakkale or "Bowl Fortress" (çanak in Turkish means a bowl). The origin of this name is explained in two ways. Some people derive it from the appearance of the fortress, apparently reminiscent of a bowl. Others link it ceramics, produced in the city and throughout the Çanakkale Province. In the 18th century, Çanakkale was already an important harbour city, and its wealth was due to its strategic position at the Dardanelles. There are numerous historic buildings is the city that testify to the multicultural character of Çanakkale. In the 18th and the 19th centuries, the city was inhabited not only by the Turks but also the Greeks, the Jews, and the Armenians. In 1914, just before the First World War, Muslims constituted about 64% of the population of the city, and the rest of its population consisted of the Orthodox Greeks (20%), Jews (10%), and Armenians (6%). In Çanakkale, there was also a large Roma community, settled here in the 15th century, to work on the construction of the Çimenlik Castle. The turning point in the history of the city turned out to be the outbreak of the First World War. In March 1915, the Allied fleet, composed of British and French warships, attacked the Dardanelles. Their goal aim was to master the sea route to Istanbul. The failure of this operation resulted in long-lasting and extremely debilitating overland campaign, which was fought on the opposite shore of the strait. The campaign, known in the West as the Battle of Gallipoli, is often referred to as the Battle of Çanakkale (tr. Çanakkale Savaşı) by the Turks. In the years that followed the creation of the Turkish Republic in 1923, the multicultural ethnic composition of Çanakkale community underwent the drastic changes. Most of the Greeks were resettled to the lands belonging to Greece, the Jews, discouraged by the hostile atmosphere and the outbursts of violence, emigrated to Istanbul, Izmir, and Israel, while the Roma community remained on the margins of the cultural life of the city. Numerous old buildings adorning the city are the most visible remembrance of the people who used to live in Çanakkale. They include Greek houses and schools on the waterfront, the synagogue in the bazaar, which was once the Jewish quarter, and the former Armenian church, transformed into the city cultural centre, in the atmosphere of the protests of the Christian community. 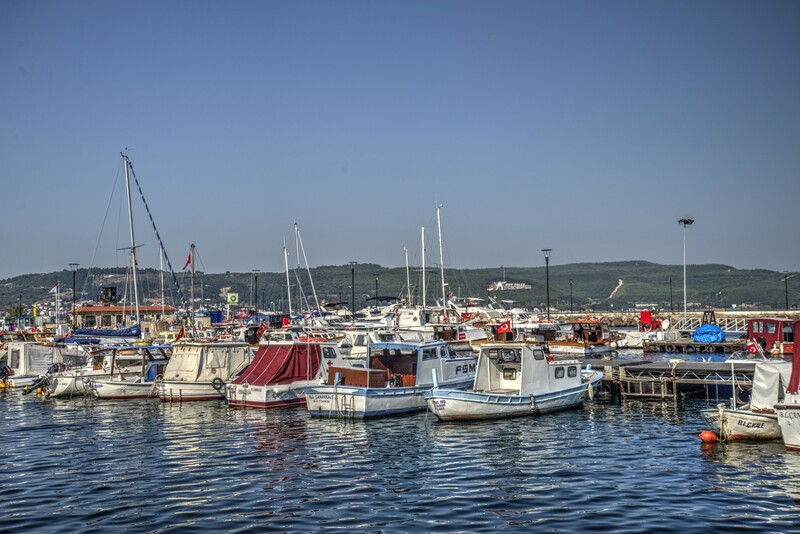 The best starting point for Çanakkale walking tour is the ferry terminal. 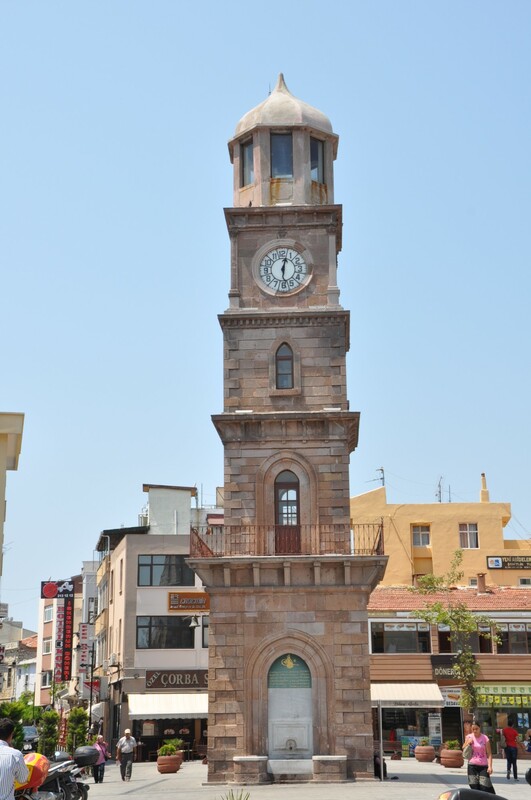 If you go to the south, just 50 meters away, on the square formed between Eski Balıkhane and Yalı streets, you will find the most famous symbol of the city that is the Clock Tower (tr. Saat Kulesi). This five-storey building dates back to the Ottoman era, or more precisely - to 1897. Its construction was sponsored by the Italian consul, who was also a wealthy local merchant. In his testament, he dedicated 100,000 gold francs for the purpose of building the tower. Today it serves as a distinctive landmark in the vicinity of Çanakkale harbour. Yalı Hanı Caravanserai, built in the same period, stands a little further, on Fetvane Street. Until the 70s of the 20th century, this building served its original function of an inn for travellers. It has now been restored and transformed into a cultural centre, which regularly hosts art exhibitions, seminars, and music competitions. In the courtyard of the caravanserai, there is a tea garden (tr. çay bahçesi). Yalı Hamam, a historical Turkish bath, operates in the neighbourhood, on Çarşı Street No. 5. It was built in the 17th century and is still open for customers. Women and men are provided with separate entrances and different opening hours. Women can take advantage of the bath from 8:00 am to 6:00 pm, and men - from 6:00 am to 11:00 pm. The price depends on the selected range of treatments and ranges from 30 to 45 TL. 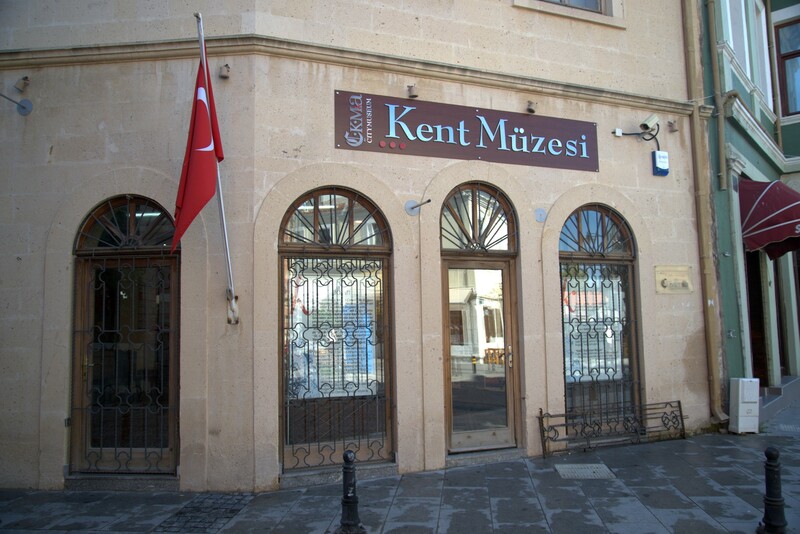 Nearby, at the intersection of Çarşı, Fetvane, and Hapishane street you can find the City Museum (tr. Çanakkale Kent Müzesi). It is a relatively new institution in the city, established in 2006. Its mission is to bridge the time gap between the exhibitions in Archaeology Museum that focusses on the ancient history of the region, and the exhibitions at the Military Museum, devoted mainly to the events of the First World War. 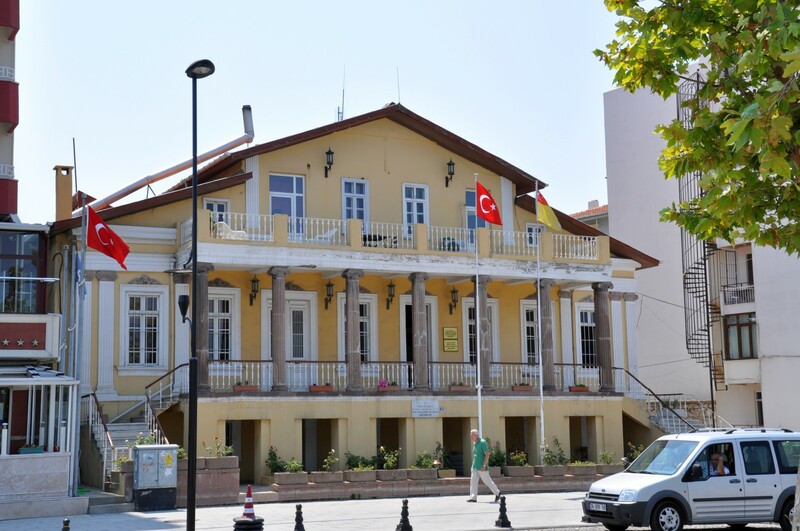 City Museum focuses on presenting the history of the Çanakkale and its inhabitants from the Ottoman era to the present times. It includes photographs, newspaper clippings, and everyday objects. The visitors can obtain information about religious minorities that used to live in the city. A separate section is devoted to the Roma community. The museum is open daily except for Mondays, from 10:00 am to 5:00 pm (in the summer, from April to August, to 7:00 pm). After leaving the area of the Military Museum, go in the south-eastern direction, along Çimenlik, Hanım, and Fatih streets. 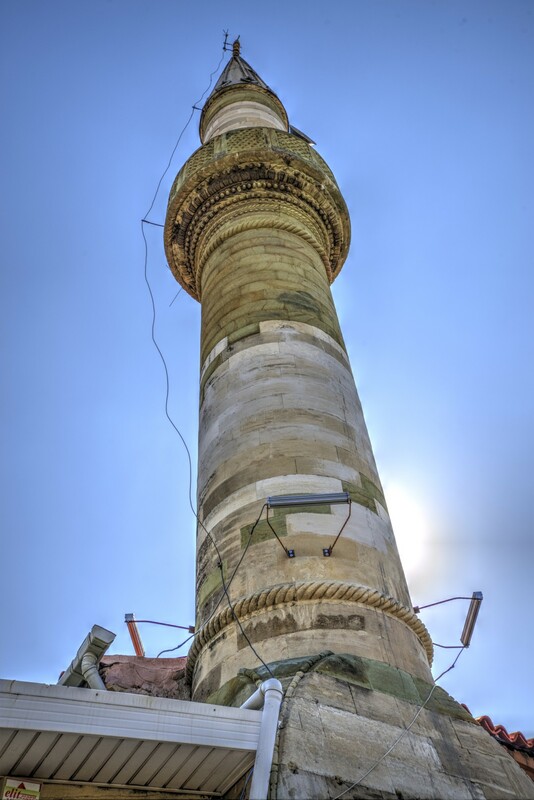 After walking about 300 meters you reach the most significant historic mosque in the city, that is Fatih Camii. It stands on the southern end of the bazaar area. The mosque was built in 1452 on the orders of Sultan Mehmed the Conqueror, whose nickname gave the building its name (fatih means a conqueror in Turkish). The mosque was renovated and rebuilt during the reign of Sultan Abdul Aziz, in the years 1862-1863. The Bazaar District is a vast, pedestrianised area. The most impressive building here is the Mirror Bazaar (tr. Aynalı Çarşı). It was built in 1889 by a Jewish merchant İlia Halyo. The famous Spice Bazaar in Istanbul was used by the architects as a model. Above the main entrance, there was a bilingual inscription, in the Turkish written in the Arabic alphabet, and in Hebrew. 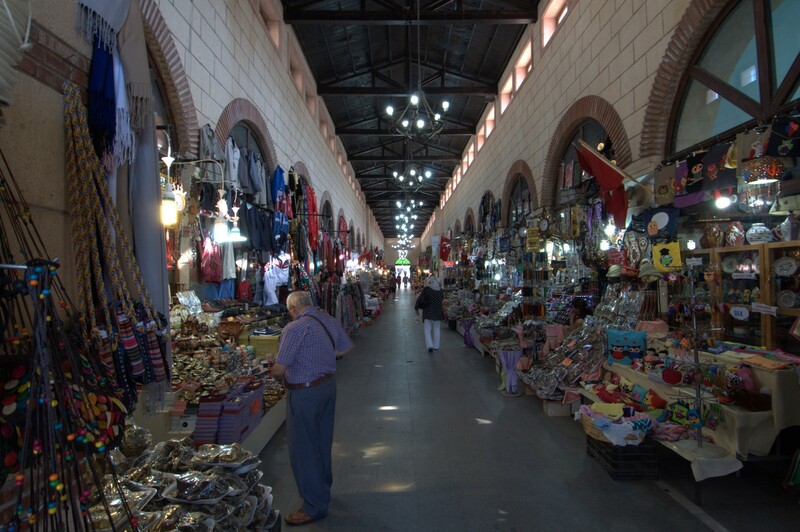 The name of the bazaar was derived from the mirrors placed at the gate, but the bazaar was also known as Halyo Çarşısı. During the battle of the Dardanelles, the bazaar was severely damaged by artillery shells fired by a British warship Queen Elizabeth. After the end of the First World War, during the British occupation of Çanakkale, the ruined building served as stables, and then it was forgotten and abandoned until the beginning of the 21st century. The inscription above the entrance was damaged during the anti-Jewish riots in 1934, and then - covered. In 2007, the Mirror Bazaar underwent a complete renovation, and since then it has been used by sellers of souvenirs, textiles, and spices. The building of Children's Mosque (tr. Tıflı Cami), built in 1892, stands opposite the Mirror Bazaar. Its name indicates that it was built to serve the needs of a school next door. Korfmann Library (tr. Manfred Osman Korfmann Kütüphanesi) operates now in the former school building. It is a relatively new institution, opened in 2007. It bears the name of one of the most important scholars of the history of ancient Troad and long-term manager of the archaeological site of Troy - Manfred Korfmann. 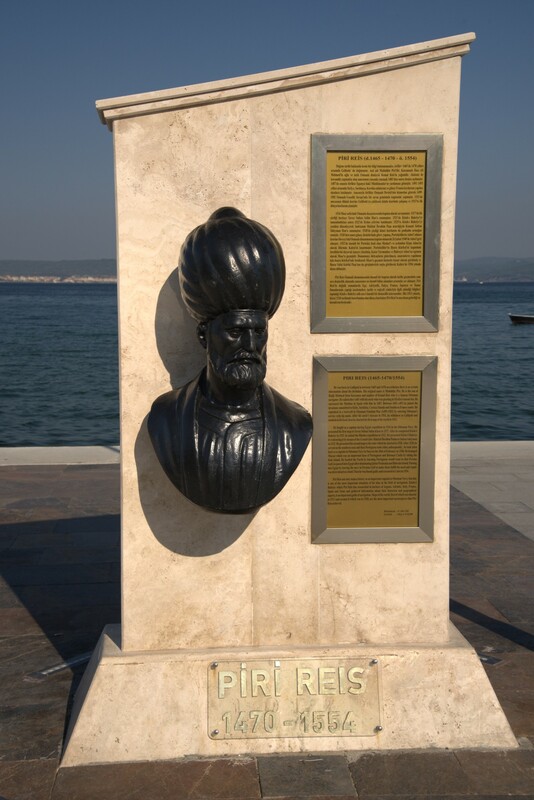 After his death, in 2005, his books and publications were given to the city of Çanakkale and soon presented to the public in the 19th-century building in the historic district of the city. The collection of the library consists of about 6,000 books and 10,000 documents, representing scientific achievements of Professor Korfmann. The library can be visited from Tuesday to Saturday, from 10:00 am to 6:00 pm. Next to the Korfmann Library, from the side of Tıflı Street, you can find Helvacıoğlu Street, leading in the southern direction. This street takes you to the Armenian Church dedicated to St. George (tr. Surp Kevork Kilisesi). The last Armenians left Çanakkale in 1915, and their former church came under the management of the city authorities. Despite the protests of the local Christian community, the temple has recently been converted into the Museum of Ethnography. The building of Mekor Haim Synagogue (tr. Mekor Hayim Sinagogu) is another reminder of the multicultural past of Çanakkale. It is the last synagogue still standing in the city. It is located at the intersection of Old Synagogue (tr. Eski Havra Sokak) and Great Baths (tr. Büyük Hamam Sokak) streets, about 200 meters north-east of the Armenian Church. Its name means "the Source of Life", and it was built in the late 19th century. The Jewish community in Çanakkale currently consists of only a few people, so the synagogue is not often used for religious purposes. However, it has been restored and is open to visitors. The best place for the last leg of the walk through the centre of Çanakkale is in the vicinity of the ferry terminal, where this walking route started. In the northern direction, there is a wide pedestrianised promenade, running parallel to Kayserili Ahmet Paşa Street. 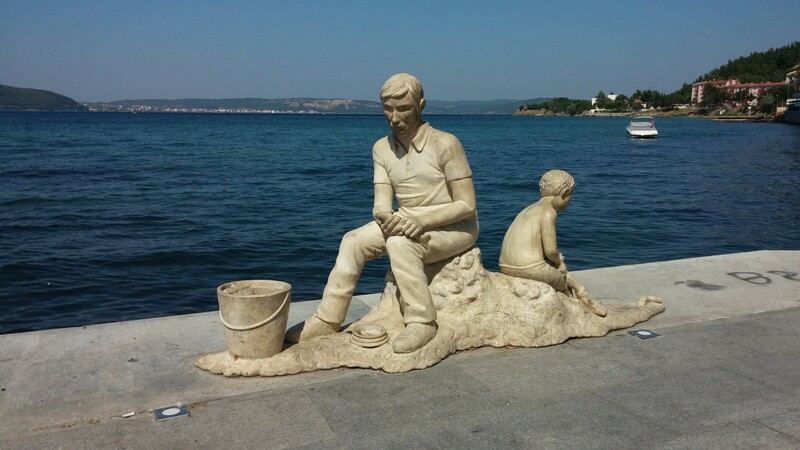 A stroll along this elegant promenade provides an excellent opportunity of watching the Dardanelles and its European shore, where the hills are covered with monumental patriotic mottoes. From the promenade, you can also see Kilitbahir Fortress. There are several tourist attractions on the promenade. The most recognisable one is probably the model of the Trojan horse. 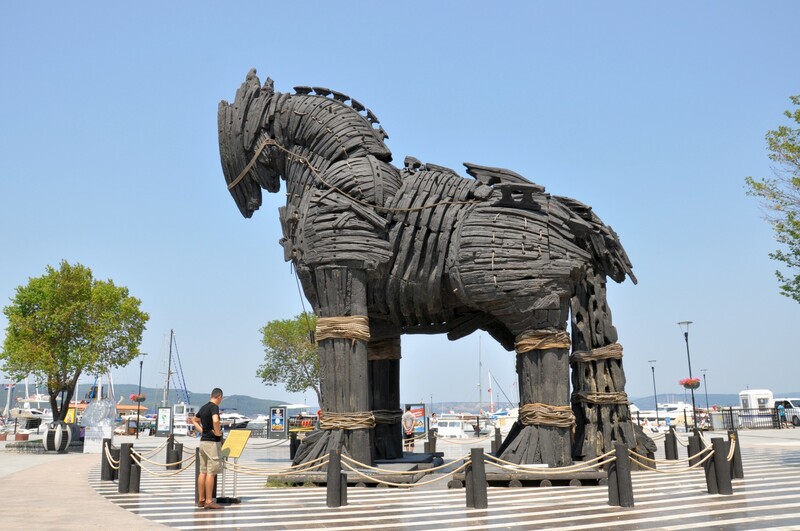 However, in contrast to the similar construction standing in Troy, it is impossible to climb into the horse in Çanakkale. This local version of the horse is mostly known for the role it played in the film "Troy" from 2004, with Brad Pitt as Achilles. Near the horse, there is a good-sized mock-up, which reproduces the appearance of Troy at the times of its glory. It is accompanied by numerous information boards and an exhibition of contemporary sculpture, referring to the theme of the Trojan War. 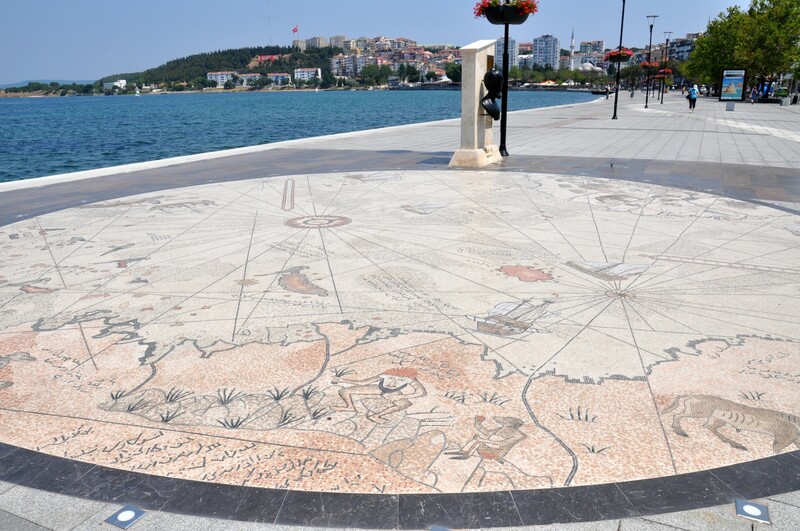 In addition, on the promenade, there is an absorbing mosaic reproducing the famous map of Admiral Piri Reis, whose bust looks at passers-by. There is also a sundial, slides for children, smaller, colourful versions of "Trojan Horses", and contemporary sculptures. Sightseeing tour of Çanakkale gets you to the tea garden, located at the northern end of the promenade, or in one of the numerous restaurants operating in this area. The city of Çanakkale lies at the point where the Dardanelles strait is narrowest, opposite the town of Kilitbahir, located on the European shore. Despite the fact that for many travellers Çanakkale is their first contact with Asia, the city turns itself towards Europe. The centre of Çanakkale, the most famous monuments, and most of the service points, restaurants, and hotels are located near the ferry terminal. The ferries that arrive here from Eceabat form a waterway that is a part of the D550 route. This route leads from the city of Edirne, located on the border with Greece and Bulgaria, to Muğla, located in the south-west of Turkey. To get to know Çanakkale just a little bit, it is necessary to take a walk around the area of less than 1 square kilometre that extends from the ferry terminal. The boundaries of this area are demarcated by the Dardanelles from the west, Sarıçay River from the south, Atatürk Street from the east, and Admiral Piri Reis Street from the north. This area is divided into northern and southern parts by the Boulevard of the Republic (tr. Cumhuriyet Bulvarı). A coastal promenade, parallel to Kayserili Ahmet Paşa Street is the most attractive area to the north of the ferry terminal. To get to the most charming historical district of Çanakkale, head to the south from the ferry terminal, down Seaside Street (tr. Yalı Caddesi). It takes you straight to Çimenlik Fortress and Military Museum. If you take a turning to the south, the Market Street (tr. Çarşı Caddesi) leads to the historic bazaar district. The main street departing from the ferry terminal is the Boulevard of the Republic, going in an easterly direction. After 700 meters the boulevard intersects Atatürk Street, extending from the north to the south. If you follow it to the south, after 4 km, you reach the suburbs, where this street joins with D550 route that acts as the ring road of Çanakkale. In the area of the city it is called Çanakkale - İzmir Asfaltı. Travelling along this route further to the south takes you straight to the most famous tourist attractions of the Troad, including Troy, 30 km away from Çanakkale. However, if you turn to the north at the intersection of Boulevard of the Republic and Atatürk Street, after 900 meters you reach another junction, this time with Admiral Piri Reis Street. By turning here to the right (to the east), after 4 km you reach a major junction. This is a point where several important roads converge: the D550 mentioned above to the south and D200 route that runs along the shores of the Dardanelles to the north-east, to Lapseki, and further, along the shore of the Sea of ​​Marmara to the east, to Bandırma. At the same intersection D210 starts, and by taking it, you go straight to the east, to the town of Çan deep in the interior of the Troad. Finding a meal along the promenade and in the surrounding area is not a problem. The simplest snacks (pretzels, mussels, boiled corn) are sold by itinerant vendors. Local cafes enjoy a good reputation, especially Notte Café and Café Barcode, that also serve salads and pasta dishes in addition to drinks. At the northern end of the promenade, there is a tea garden known as Golf Çay Bahçesi. It is a place frequented by Turkish families, with lovely views of the Strait and the opposite shore. 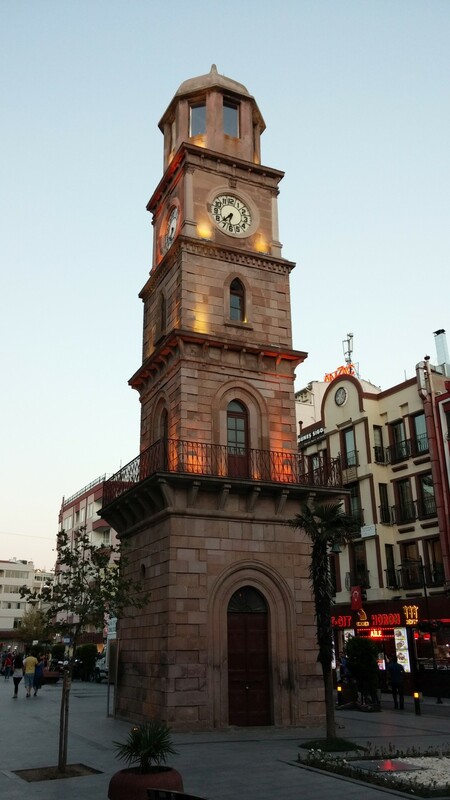 Clock Tower Square (tr. Saat Kulesi Meydanı) is a place where you can find several restaurants. We recommend so-called soup salon (tr. Özel Çorba Salonu), where it is possible to get a tasty lentil and tripe soup 4 or 5 TL. In the same area, there are numerous cheap eateries where you can fill your stomach at very modest prices. Bars and pubs are concentrated in Çanakkale in a tangle of narrow streets between the Clock Tower and the Military Museum, for instance on Matbaa and Fetvane street. These venues enjoy a good reputation among young Australians, so you should expect a rather international menu (pizza, sandwiches, toast), and not traditional Turkish fare. The best fish restaurant in the city is called Yalova, and it is situated on Customs Street (tr. Gümrük Sokak). You can personally choose the fish that will be prepared for you, and the prices of main dishes range from 15 to 20 TL. The largest concentration of shops of all kinds in the centre of Çanakkale is located in the bazaar district, with the historical Mirror Bazaar at its heart. If you are after fresh seasonal products, head to the Friday Market (tr. Cuma Pazarı) that takes place every Friday, on a specially designated area (tr. Pazar Yeri), on the east side of Atatürk Street. The largest shopping centre in the city - Kipa AVM - is situated in Barbaros district, on the south side of the city, just off D550 route. There is a large CarrefourSA supermarket closer to the centre of Çanakkale, on Atatürk Street, next door to the coach terminal. Most of the service points needed by tourists are located in the immediate vicinity of the Cumhuriyet Square, right next to the ferry terminal. There is a post office, ATMs, and telephone booths, as well as local tourist information office. This office provides helpful transportation advice, its staff speak English and have handouts in the form of brochures and maps. The office is open from 8:00 am to 7:00 pm during the summer season (July-September), and from 8:30 am to 5:30 pm during other months of a year. In Çanakkale, you can easily rent a car, and this kind of transportation is extremely helpful when visiting this part of the Troad. Small vehicle rental agencies are located on Dibak Street, just off to the right from the ferry terminal and on Cumhuriyet Boulevard. You can also find car rental agencies at the local airport (tr. Çanakkale Havaalanı), located 3 km to the east of the city centre. By ferry: as there is no bridge over the Dardanelles yet, the only way of crossing the Strait to its Asian shore is by a ferry. The main ferry line connects Çanakkale with Eceabat. The ferries offer regular connections, at all times of day and night. At night, there travel every two hours, and during the day - every hour. In summer, the frequency rises to two ferries per hour. The crossing takes approximately 25 minutes. The price for a passenger car (with all passengers included) is 29 TL, and a single ticket per person costs 2.50 TL. Alternatively, it is possible to take a ferry to Çanakkale from Kilitbahir. The ferry crossing takes only 15-20 minutes, depending on weather conditions. The connection is provided by a private shipping company, and the ferries can take only several passenger cars aboard. The ferries depart several times a day, but often it is necessary to wait for the departure as they set off when they are full. The price per person is 1.50 TL, and for a passenger car - 18 TL. Other ferry connections from Çanakkale include the cruises to Turkish islands in the Aegean Sea. A ferry to Bozcaada departs several times a day; the crossing takes about 40 minutes, and a ticket for one person costs 20 TL. Once a day (around 5:00 pm) you can get to the island of Gökçeada. The ticket costs 25 TL per car or 3 TL per person, and the trip takes 2.5 hours. By coach: Çanakkale coach terminal (tr. Çanakkale Otogarı) is located at the intersection of Atatürk and Demircioğlu streets, about 850 meters east from the ferry terminal. The coaches starting from this terminal provide connections with the major cities of Turkey, including Ankara (10 hours, 60 TL), Antalya (12 hours, 80 TL), Bursa (4.5 hours, 40 TL), Edirne (4.5 hours 35 TL), Izmir (6 hours, 45 TL), Şanlıurfa (23 hours, 100 TL), and Istanbul (6 hours, 45 TL). By minibus: Çanakkale minibus station (tr. Minibüs Garajı) is located near Sarıçay river, 1 km south-east from the ferry terminal, at the intersection of Köprübaşı and Atatürk streets. The most important connection (from a tourist's point of view) is the one to Troy. Minibuses depart in this direction every hour between 9:30 am and 4:30 pm (in summer till 7:00 pm). The ride costs around 5 TL and takes 40 minutes. Please note the last return minibus from Troy to Çanakkale departs at 3:00 pm (5:00 pm in summer), which means that you might need to stay in Troy if you decide to visit this site in the afternoon as there are no other public transport options in the evenings. By car: if you drive from Europe, it is necessary to cross the Dardanelles by ferry. Çanakkale is located at the intersection of two European routes. Route E87 goes from the border with Bulgaria in Malko Tarnovo, throughout Eastern Thrace and the Gallipoli Peninsula. Route E90 runs from the south-eastern Anatolia through Adana, Ankara, and Bursa. Two main roads from Çanakkale run along the coast. Route E90 goes in the north-eastern direction, the Dardanelles, and then through the town of Biga to the large port city of Bandirma (166 km). Route E87 goes to the south-east, through Ezine and Ayvacık to Edremit (130 km). The inland road runs through the town of Çan to Balikesir (191 km). Caution! Parking a car for free in the city centre, next to the ferry terminal, is virtually impossible. In the immediate vicinity, there are private parking lots, where you pay up to 5 TL per hour. If a short walk is not a problem for you, look for a parking place in the northern direction, along the streets perpendicular to the promenade. Traffic jams occur regularly in the centre of Çanakkale, but they quickly disappear as their presence is related to the times of ferry arrival. By plane: local airport (tr. Çanakkale Havaalanı) is located about 3 km east of the ferry terminal. 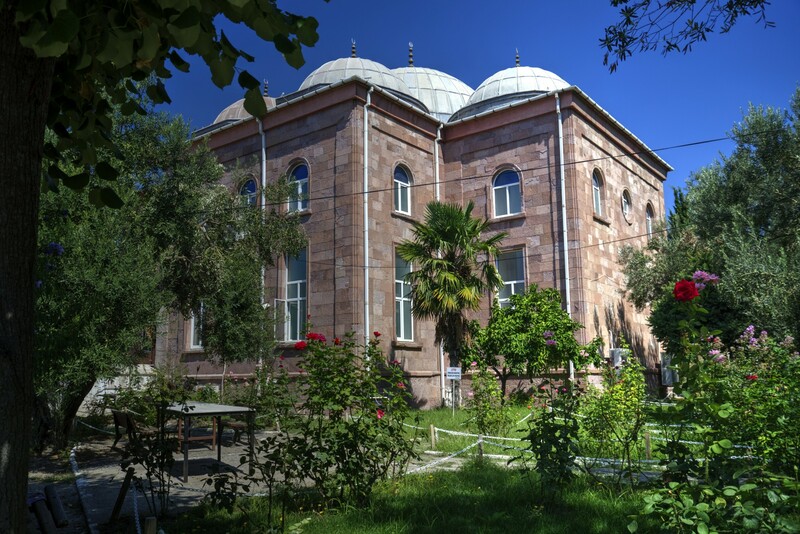 It is connected to the city centre with shuttle buses (ticket price is 7 TL) that start near Necippaşa Mosque, located next to Golf Çay Bahcesi tea garden. These shuttle buses also stop at the ferry terminal. A taxi ride from the centre to the airport should cost around 10 TL. From the airport in Çanakkale, it is possible to fly directly to Istanbul, to Sabiha Gökçen airport, located on the Asian side of the city (six times a week), and to Ankara (four times a week). If you plan to stop for a night in Çanakkale, remember the dates of the anniversaries of the battles of Gallipoli. Book your accommodation well in advance if you are planning to visit in March or April. In other months of a year, it often turns out that the prices offered via online booking platforms are much higher than if you go directly to the selected hotel and ask for a room. 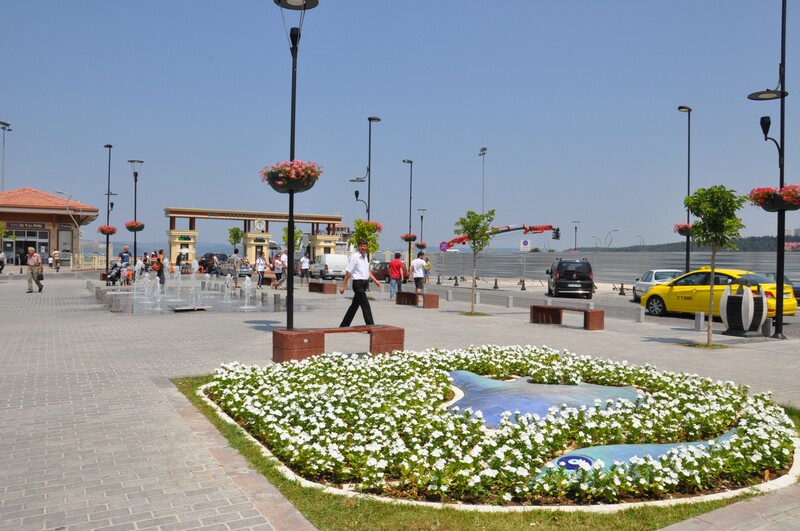 Most hotels and B&Bs in Çanakkale are located close to the ferry terminal. On the one hand, it is a great facilitation for visitors, since many tourist attractions are situated nearby. On the other hand, if you come to Çanakkale by car you may have a problem with finding a parking place. Note that the information provided by hotels in this area states that the guests can use public parking lots nearby. However, in practice, it is difficult to find free parking space in the centre of Çanakkale, and you may need to use paid private parking lots. 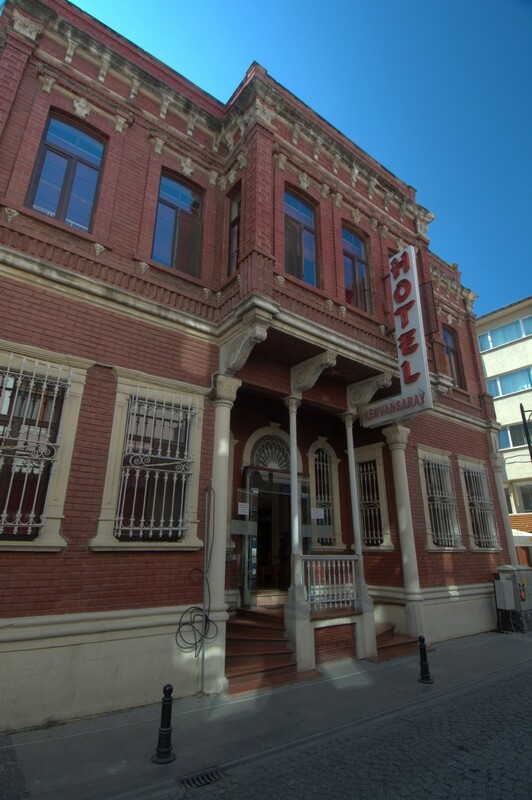 Des Etrangers Hotel - housed in a historic building, located on Yalı Caddesi No. 25/27. The hotel has its restaurant, and breakfast, included in the price, is served in the buffet form. This is one of the more expensive accommodation options in the city, as you have to pay at least 200 TL for a double room. Helen Park Hotel - located right next to the ferry terminal, on Tekke Caddesi No 10. This hotel is highly rated by its guests and much cheaper than Des Etrangers Hotel. Expect to pay around 120 TL for a double room with breakfast. Anzac Hotel - located near the famous Clock Tower. Its main advantage, in addition to the central location, are soundproofed rooms and a relatively low price. You have to pay around 100 TL for a double room with breakfast. Büyük Truva Hotel - located on the coast, next to the marina. It boasts stunning views of the Dardanelles and has two rooms adapted for people with disabilities. Double room with breakfast costs 210 TL. Grand Anzac Hotel - on Kemalyeri Caddesi No. 11. Guests are offered bicycle and car rental. The breakfasts are highly rated by guests and accommodation in a double room costs from 110 TL. Kervansaray Hotel - located on a side street, Fetvane Caddesi No. 13. The hotel is housed in a historic building, but in spite of being assigned to the category of boutique hotels, it offers a moderate standard and equally moderate prices. A double room with breakfast costs around 150 TL. Parion Hotel - 1 km away from the ferry terminal, on Demircioğlu Caddesi No. 130. This is the most luxurious lodging option in Çanakkale, as the hotel has an indoor swimming pool, a hammam (Turkish bath), and a spa centre, and the rooms are very spacious. Rates start at 300 TL for a double room and can reach up to 650 TL for an extensive suite. Saricay Hotel - located slightly further from the centre, on the banks of Sarıçay River, on Reşat Tabak Caddesi No. 18. In contrast to Parion Hotel, this hotel is a place to stay for a moderate price that is, for about 120 TL for a double room with breakfast. Dort Mevsim Suit Hotel - in the heart of Barbaros district, on Binboga Caddesi No. 1. It is an apartment hotel, which means that its guests enjoy fully equipped apartments with an area of ​​60 square meters each. Each apartment can accommodate up to 4 people, but the price depends on the number of guests (from 100 TL for one person to 200 TL for four guests). Zileli Hotel - in Kepez, on Ibrahim Terzioglu Caddesi No. 7. The hotel is located next to a big shopping centre and only a short walk from the coast. Price per night in a double room with breakfast is about 140 TL.